The Man for Me: Boiled Belly & Lentils – Eat Me. Drink Me. This excerpt also happens to capture the other thing I love about Fergus, namely the lack of prescription in his recipes. For Fergus, there are no absolutes. Cooking is about taste and feeling and improvisation. In a recipe for Salt Cod, Potato, and Tomato, he asks you to cook potatoes, tomatoes, and garlic until they’re “ready.” Or in this recipe for Stake, Capers, and Bread: “Add the lemon juice, allow it to sizzle and turn brown, and add the capers. At the last minute add the parsley and straightaway pour over the fish.” There’s something refreshing about a recipe that doesn’t rely on minutes, but on the senses. And learning to rely on yourself rather than a “rule” in a book is what turns a competent cook into an intuitive one. My first foray into The Whole Beast was a recipe for Boiled Belly and Lentils, whose headnote reads: “This dish celebrates the not quite meat, not quite fat, quality of pork belly. There’s nothing like a pork belly to steady the nerves.” The recipe calls for brining a slab of pork belly for ten days, then cooking it slowly over low heat in a broth of vegetables and pepper and serving it with garlickly lentils. For ten days, as I prepared other dinners, I had my brining pork belly in my mind. Every time I opened the fridge, I wondered what magic was happening in that lidded Tupperware. And on the tenth day, I rinsed the residual salt from my brined belly and put it in a pot to cook. A beatific moment to be sure. Nothing was quite so nice as to slice up chunks of pork belly, the salty, rich meat complimented by fat so tender it absolutely melted in my mouth. 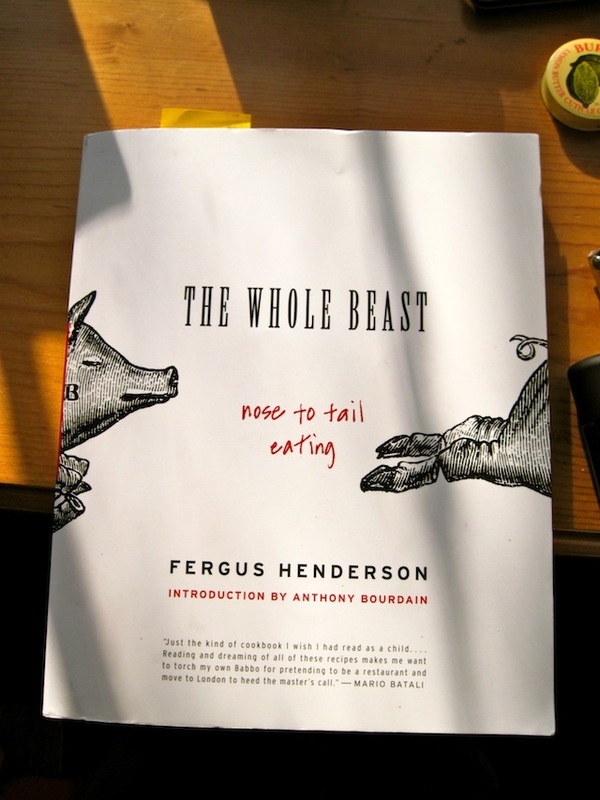 Of my own volition, I would never have eaten the fat, but Fergus, dear Fergus said, “Encourage your dining companions to eat the fat and all.” And I thank him for that, because I would have missed a most amazing thing. Pork belly fat doesn’t taste like other fat, which can be chewy and leave a behind terrible residue. 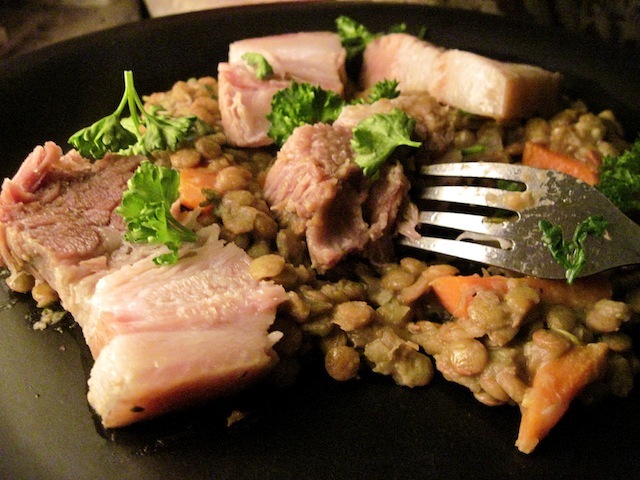 Brined pork belly fat, especially with a spoonful of staid lentils, is soft and flavorful and wonderful to eat. What’s next for me and Fergus? Bone marrow? Blood cakes? I don’t know what it will be, but I think I’ll know when the time is right. Fergus has this to say about pork belly: “Pork belly is a wonderful thing. It’s onomatopoeic, belly is like it sounds – reassuring, steadying, and splendid to cook due to its fatty nature. It’s not a cut of meat to rush; with that, a certain calm is imbued in the belly.” I’m not sure how verbatim I can copy this recipe, but I’ll try to leave as much Fergus in there as I can. Quantities are adjusted to the amounts I used and I’ve mentioned some of my techniques. But I think Fergus would be ok with a little improvisation. Adapted from The Whole Beast. Serves 2 (with lentils left over for days). While your belly is cooking, start on the lentils. 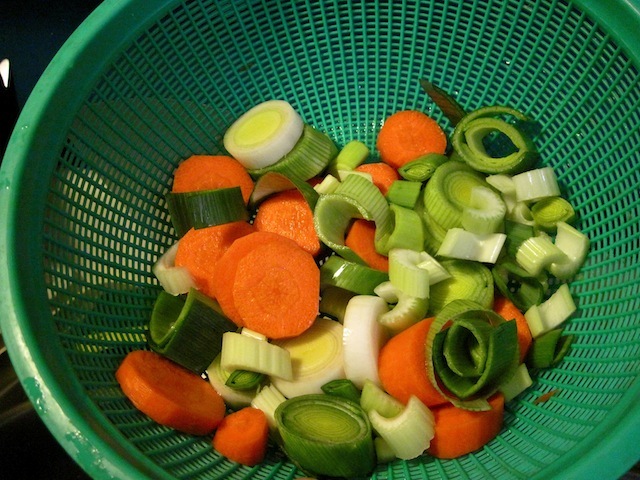 Cover the bottom of a large pan with olive oil and sweat the chopped vegetables. When they have just started to soften, but not color, add the lentils and stir for a few minutes to coat. Cover with water and “nestle in the thyme and parsley bundle.” Reduce the heat to low and stir infrequently. “You want the lentils soft but not squidgy, so that they have reserved their lentil integrity, but are not still individual hard nuts.” The cook time should be about forty minutes – add more water if they start to dry out but are not done. Thanks, Kelsey! Just took a gander at your blog – looks like we’re playing the same sorts of games with big appetites and little money (which of course means that the roasted red peppers will probably end up standing in for sun dried tomatoes regardless of whether you’ve checked the pantry… and it will probably be delicious). Hooray for city living and post-Davidson budgets!